Written by Sarah Ramsey, a non-profit management intern at Doc Wayne. When you think of therapy, what do you picture? Most of us imagine a therapist or clinician seated at their desk, directly across from a patient. Maybe some would even think of Freud and imagine the client lying on a couch, spilling their childhood troubles. Doc Wayne provides a unique form of therapy that utilizes the power of sport. Picture a small grassy field in Framingham, MA. There is a group of seven kids playing soccer and flag football. Laughter, encouragement, and sometimes competitive jousting are heard. Three coaches are also present, playing alongside the kids. This is Doc Wayne’s version of therapy, and it works. This week, I was lucky enough to leave the Boston office of Doc Wayne and participate in two of our Chalk Talk® Sport-Based Group Therapy sessions. Doc Wayne fuses sport and therapy to heal and strengthen at risk youth. Chalk Talk® Sport-Based Therapy groups are clinician led groups, which are assembled by age and location, and held weekly. The group I observed was playing soccer, but groups also play flag football, basketball, and participate in indoor rowing. The groups teach principles of do the good®, Doc Wayne’s curriculum, using both didactic and interactive approaches. Upon arriving, the children gathered into a “Circle Up.” We went around the circle stating a “Kick” (a current positive point in our life) and a “Miss (a low point). Then it was time for a warm up. We played freeze tag with soccer balls. Once you were tagged and frozen, the only way to become unfrozen was to have a teammate pass you a soccer ball. Most of the kids were eager to get out there and move. They volunteered to be “it,” and played hard despite the heat. There were a few kids who did not participate fully, but the coaches encouraged them to engage at their own level and met them where they were at. This choice by the coaches really created a safe atmosphere for the participants. Next up was a scrimmage. Two participants were selected as captains and they each chose their team made up of Doc Wayne coaches and kids. It was so much fun playing with the participants and it made me realize why Doc Wayne is so special. Doc Wayne allows these kids to be kids. It sounds simple enough, but so many of these participants are carrying burdens that no child should have to carry, whether it is mental illness, abuse, etc. Doc Wayne programs give them an hour out of their day to kick the soccer ball, joke with coaches, show off their skills, and encourage each other. My favorite part of the visit, was the “Circle Up” after we had finished the scrimmage. Kids gave each other “Shout Outs” for playing hard, giving encouragement, etc. Not only is Doc Wayne a safe and fun environment for the kids, but it also teaches them important social skills such as being respectful of others, and gives them confidence and affirmation. I am so proud to be a member of Doc Wayne for the summer and can’t wait to see how Doc Wayne keeps changing the game for at risk youth. For more information on Doc Wayne please visit http://www.docwayne.org or follow us on twitter @DocWayneDtG. In partnership with Community Rowing and the Joseph M. Tierney Learning Center, Doc Wayne provides an indoor rowing program for Chalk Talk® sport-based group therapy participants. 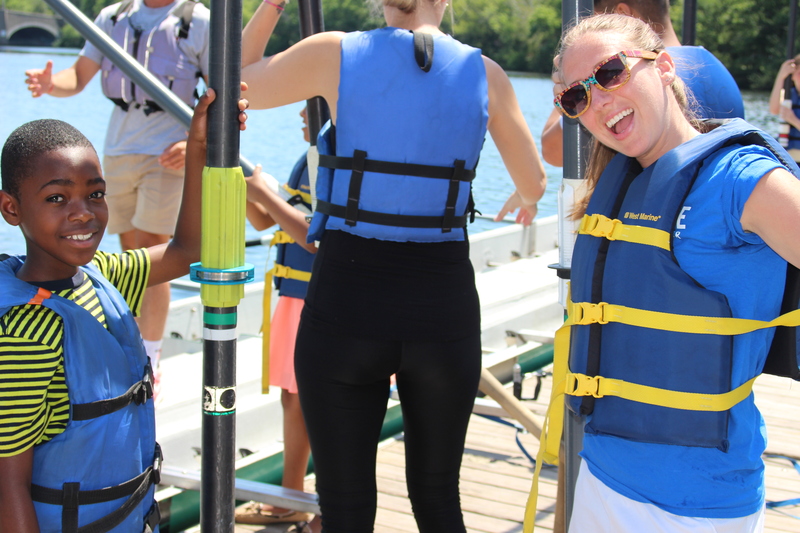 The program is a valuable opportunity for youth to learn about the sport of rowing while receiving accessible and engaging outpatient group therapy in their community. After 7-weeks on the ergs, Chalk Talk® participants put their skills to the test on the Charles River. On the water, Chalk Talk® youth and coaches worked as a team to successfully move the boat while enjoying a beautiful cruise around the river. 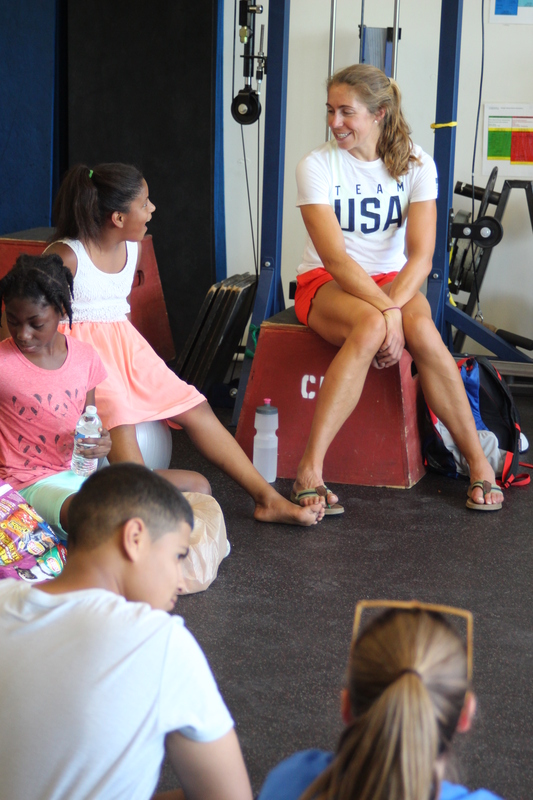 After putting forth great effort in what was the first experience rowing on the water for most, youth were visited by Dr. Gevvie Stone, a US Olympic Rower. Gevvie shared her story of setting and completing various goals both on and off the water, her successes, setbacks, as well as the obstacles that she encountered along the way. Gevvie emphasized the importance of doing what you love, being passionate about what you choose to pursue in life, and building your support team. Youth refueled with lunch while receiving their certificates acknowledging the hard work they had put in throughout the program. Doc Wayne is appreciative of our collaborative partners, Community Rowing and the Joseph M. Tierney Learning Center and look forward to upcoming trips to the boat house! Additional photos of the event can be viewed here. For more information on Doc Wayne please visit us at http://www.docwayne.org or follow us on twitter @DocWayneDtG. This summer has seen an exciting new expansion of Doc Wayne’s sports therapy programming in partnership with the Joseph M. Tierney Learning Center at the Homes at Old Colony in South Boston. Through a collaboration with Boston ASAP, Doc Wayne is providing Chalk Talk group therapy to the youth residents of this community. Intake of participants for this course of treatment began in July and the first official session was successfully conducted on Thursday, August 22rd. Below is Old Colony’s beloved Coach Eddie preparing to help out Doc Wayne clinician and GM Rebekah Roulier in delivering the inaugural Chalk Talk session. 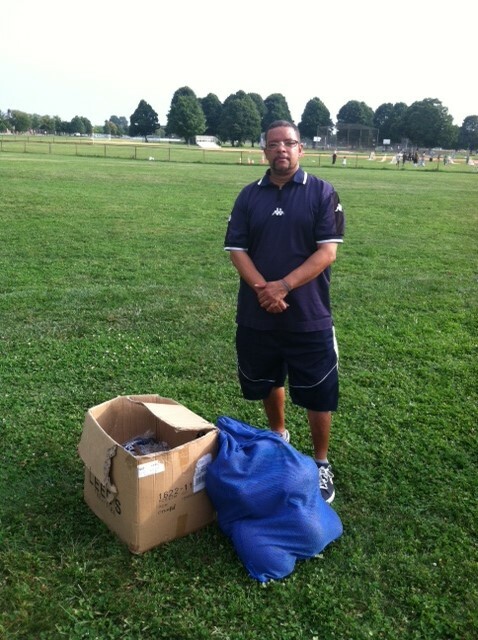 Old Colony’s Coach Eddie ready to help out! Through Boston ASAP, Doc Wayne provides Chalk Talk as a billable, sport-based group therapy program that creates a clinician-guided environment where sport is the lens through which youth examine important social and emotional issues in real-time. The curriculum teaches the principles of do the good ® by both didactic and interactive approaches. In a series of weekly sessions, participants undertake written goal setting and movement-oriented exercises to develop the thoughtfulness, sense of competence, and feeling of effectiveness that are derived from positive sport participation and are essential to social development. Through Boston ASAP, Chalk Talk will be offered statewide. If you would like more information about Doc Wayne or Chalk Talk, please email us at info@docwayne.org or follow us on twitter @docwayneDtG. On Tuesday, our Doc Wayne girls program celebrated the mid-point of the season with an All-Star Game and Skills Competition. The majority of our players in this particular “division” of Doc Wayne are victims of complex trauma and have suffered life events that most people would classify as horrifying. Despite this, our Doc Wayne athletes have picked themselves up (often with the help of others) and kept going. They keep trying to live, achieve, and reach for their dreams. Their strength and resilience is evident at events like this as they run the 40 yard dash and weave through the obstacle course. Their smiles and laughter say it all. If you need some inspiration come watch a Doc Wayne game. To my 140 heroes. do the good. What is “do the good?” Doing the Good is about getting to a place on the field and off the field where you feel effective, and you got there without doing any harm to anyone else. In other words, it’s about working hard to find your ‘positive path.’ As we begin our blogging journey here at Doc Wayne, we invite you to tell us how you “do the good,” in what moments you feel effective and how you are working hard to find your positive path.